You might ask: "Commitment to whom?". My experience says: "Commitment to yourself!". 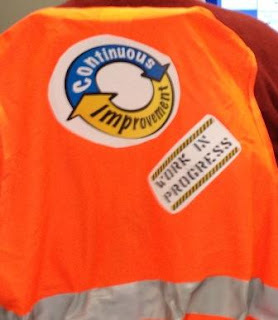 I've seen several times many teams striving with practically implementing the agile key concept of Continuous Improvement. That’s why I decided to talk about this subject in my first post: no (r)evolution exists without improving and adapting. The fact is that Continuous Improvement, as many things, does not happen naturally, but requires some steps. The first step is to "stop the line" and take the time to reflect on hot things are going and find ways to improve. A Scrum team could say: "Great! We have this. We do Sprint Retrospectives!" The second step is to have effective retrospectives. It means finding SMART actions the team can concretely try and measure results. A good Scrum Team can reply: "Our Scrum Master is good. We always manage to find SMART actions to implement". That's still not enough. You need to plan for them to make that happen. And Scrum helps us again here: thumb rule should be that a team plans at least 10% of the Sprint time to dedicate to improvement actions, so that it has the necessary fuel to boost innovation. The bad news is that this is still not enough. A lot of teams plan time to implement their retrospective actions (even though a lot do not indeed) and still strive to innovate. That's where commitment to yourselves comes into play. If you want to improve, you should take it very seriously and be disciplined in making it happen. Nothing normally happens in agile without discipline. But discipline could be funny as well. Below is a picture which shows the agreement found by one of the teams I coached: every day one person must work on an improvement action. He/she takes the role of "Innovator of the Day" and deserves a prize: the jacket you see in the picture around his/her chair. Do you think it is enough now? No, it's not. Have you ever heard about Active Learning Cycle? The point is that applying an empirical process to improvement as well. It's not sufficient to try things, you have to evaluate the effectiveness of the actions you tried and consciously decide whether to keep or drop them. Looks difficult? Might be. I'm not saying it is easy, but it is not impossible.